We provide our luxurious services at affordable rates and you don’t have to pay extra for waiting charges. 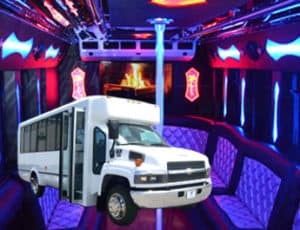 We are open to party bus bookings for various events like weddings, birthdays, theme parties, a night on the town, and many more. Our party bus in Scottsdale & Phoenix is the most desired and booked transport service for all types of parties. “Wouldn’t it be easier if we just drove ourselves?” Those were my husband’s words a week before our anniversary celebration. We had a party of 12 going and he wanted to drive. I said no way, called Night on the Town and had just that. The service was unlike any other, thank you for making the night special!! My friends and I love going to a concert, sometimes we have a huge group make our way down to the venue. Anyone who has gone to a concert knows that parking can be such a hassle and getting out of a parking lot after a show can be frustrating. Now rent a limo from this company and have an even better time. These guys are the best! We have a big family, so getting everyone together can be a real hassle. Especially when we try to figure out who can drive who. With the buses at Night on the Town, we no longer have to worry about that. In fact, it has made getting all of the family together for a fun dinner that much easier and enjoyable. While people normally reserve a limo just for a wedding day, we used one for our rehearsal dinner. Our driver was very nice and it helped to ensure we all got to the church and then the dinner afterwards on time. Which greatly relieved our stress. We also used them for our wedding day and they offered the same great service. I definitely recommended hiring them. As a parent, I always want to make sure my child is well taken care of when they go out. Which is why I, and a few other caring parents, hired Night On the Town for our kid’s prom night. When we voiced our concerns about getting them to and from the dance safely, they reassured us that they would make sure of their safety. They lived up to their promise and our kids had a great time! A wedding is a very special occasion that is meant to be cherished forever. Let us elevate your presence and get you noticed on your prom day. Night on the Town Limo Service is now offering a Tailgate Party Service in Phoenix. There cannot be any more special day for your teenage daughter than her Quincenera. Night on the Town Limousine Service offers the best and efficient party bus services. We offer the exclusive party buses with a variety of luxury facilities in Phoenix. Create your own party with our luxurious Night On The Town Limousine Service. We provide exclusive Phoenix and Scottsdale Party Bus services in Arizona at affordable rates. The best part is you don’t need to have an exclusive pass, pay a cover charge, or wait in line to get into the party with us. We are open to party bus booking for various events like weddings, birdthday, theme parties. night on the town and many more. Our party Bus in Scottsdale & Phoenix is the most desired and booked transport service for all parties. We have well trained, professional and friendly chauffeurs, who will provide you a safe and comfortable ride. You just need to focus on partying in our esteemed party buses. We are here to provide you with the best limos and party buses. Our party bus and limousines are custom built to serve the demand of our clients. At Night on the Town Limousine Service, we always offer you a celebrity-like treatment. Our stylish Party Bus service is available 24/7 for your convenience. Take a cruise to any location or event in our limousines and party buses. It is the perfect and the most stylish way to attend your event. Just hire our party bus rental service to make a grand fairy tale like entry or a show stopping exit in any event. 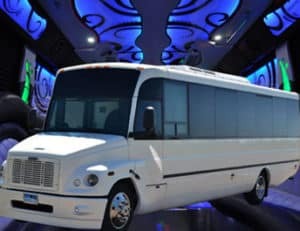 Our party bus rentals are best for weddings, proms, bachelor parties, birthdays, corporate events. Party anyplace anytime. Create lifelong memories with our limos and party bus rentals. 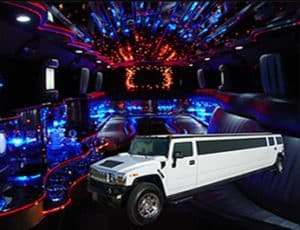 Our limousine and party bus rental services are best suited for attending proms, getting to weddings, celebrating birthday parties, to host bachelor or bachelorette parties, attending corporate events or just for a casual night out with friends.